When I think of Florida, I always remember the amazing experiences I have when visiting it, from the amusement parks in Orlando to Winter Music Conference in South Beach and from diving in one of the most exciting places in the US (and the world) – Key Largo to ecological diversity of Everglades and the history of Florida Keys. Hence, when my husband had to attend a business conference at Boca Raton, Fl, I tagged along, especially since we were to spend 5 days at the world famous Boca Raton Resort and Beach Club, A Waldorf Astoria Resort. I didn’t venture much outside the resort, except to check out Mizner Park in Boca Raton’s downtown and to visit Gumbo Limbo Nature Center, however, I spent lots of quality time utilizing every facility and eating at every restaurant the resort had to offer. So, here is my adventures at Boca Raton Resort and Club. The earliest known inhabitants of the Boca Raton area were the Tequesta Indians, who lived in communities near the ocean as long ago as one thousand years until being “discovered” by the Spanish voyagers in the 18th century. “Boca Ratones”, the original name given by the Spaniards, meant “a shallow inlet of sharp-pointed rocks which scrape a ship’s cables.” And it was originally located to the south, in present-day Biscayne Bay in Miami. In 1823 a mapmaker, while copying the documents, mistakenly moved its location to the north and began referring to the city’s lake, today known as Lake Boca Raton, as “Boca Ratone Sounde.” The name stuck to the area and it is known today as Boca Raton. It didn’t take long for the Spanish and the Brits to clear the area from the indigenous people but for a long time, it largely remained uninhabited. The first significant settler to this area was Captain Thomas Moore Rickards in 1895, who resided in a house made of driftwood on the east side of the East Coast Canal. The Florida East Coast Railroad (FEC) hired Rickards to promote the area to farmers who would ship their crop via the FEC. Rickards produced the first survey of Boca Raton; he subdivided several hundred acres of land and sold the lots to northerners for growing pineapples and orange trees. Rickards planted 50 acres of his own land, called “Black Cat Plantation”, however, after his groves and fields were destroyed in a hurricane in 1903, he moved to North Carolina. The expansion of the Florida East Coast Railway, connecting West Palm Beach to Miami made the region accessible to a group of resourceful pioneers. Amongst these were a group of Japanese immigrants under the leadership of Joseph Sakai, who formed a community along today’s Yamato Road in 1904. Japanese farmers of the Yamato Colony converted the land west of the city into pineapple plantations, however, the colony never grew very large due to a blight that destroyed much of their crops and subsequent competition from Cuban production. By the 1920s, many of the colonists had returned to Japan, but the Japanese heritage of the Yamato Colony survives in the name of Yamato Road and in the Morikami Museum and Japanese Gardens, located northwest of the city limits. In May of 1925, the Town of Boca Raton was incorporated at the height of the Florida land boom, when several investors were interested in turning it into a resort town. 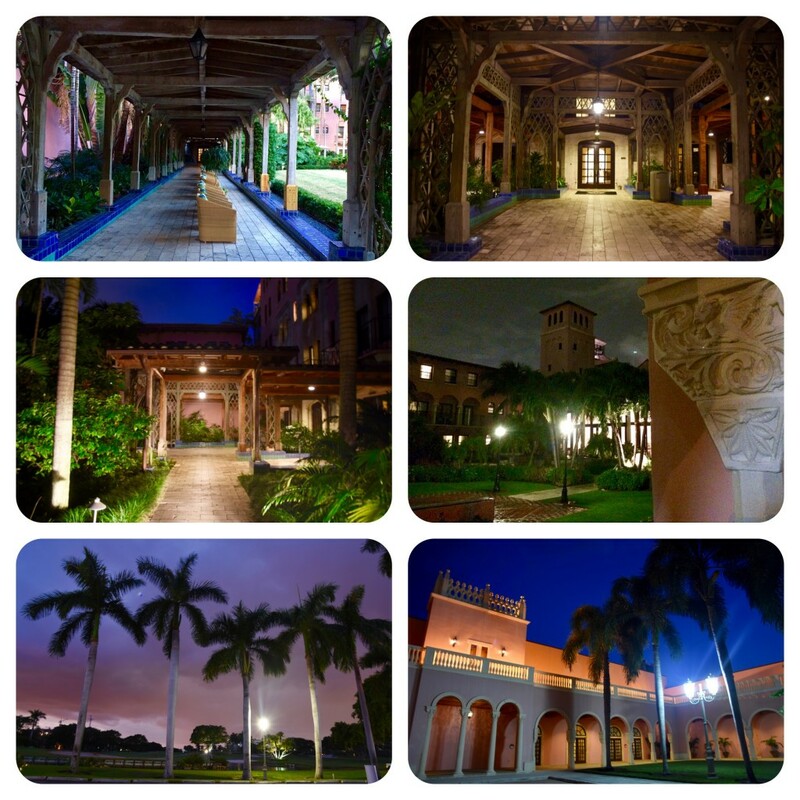 Most famously, Addison Mizner had several projects for resorts and mansions in the area. 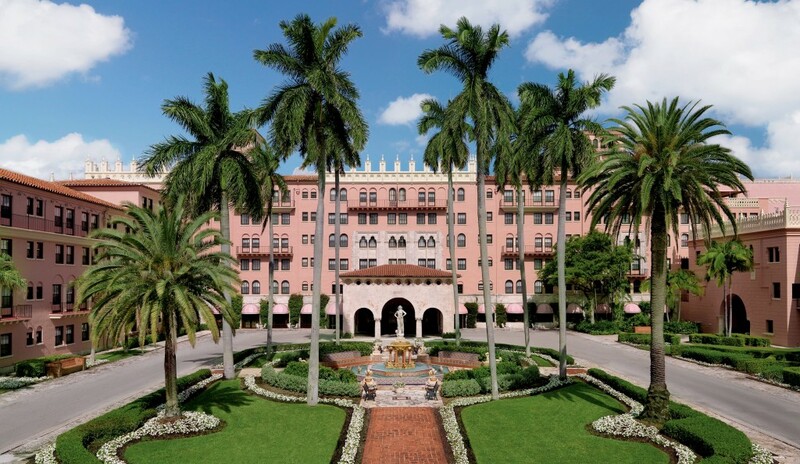 His exclusive hotel Ritz-Carlton Cloister Inn was built in 1926, later renamed the Boca Raton Resort & Club, and is still one of the only “5 star” hotels located in Florida. Although many of Mizner’s plans for the young community were squelched by the demise of the land boom in 1926, a few survive today—and his architectural style continues to influence the city (ex. Town Hall – the home of the Boca Raton Historical Society and its History Museum). In the 1930s and 1940s, Boca was known for its winter vegetable crop, particularly the green beans which commanded a premium in northern markets. In 1942, the Army Air Corps established its only war-time radar training school at the site of what is today Florida Atlantic University and the Boca Raton Airport. The facility brought thousands of servicemen as well as families and civilian employees to the tiny community of Boca Raton, with a population of 723 people in 1940. In the 1960s, South Florida experienced another great land boom, with developments pushing the Everglades and former farmlands increasingly westward. The population grew to almost 30,000 residents by 1970, continuing to increase well outside city limits to this day. In 1962, Boca Raton attracted the newest state university, Florida Atlantic, to the site of the old army airbase. IBM moved one of its computer facilities to Boca Raton in 1967, and in 1981, it was there the first IBM PC was developed. During the 1980s and 1990s, the city focused much of its attention on downtown redevelopment, and a number of important historical properties, such as Boca Raton’s original Town Hall and F.E.C. Railway Station were restored and opened to the public. In 1991, the new downtown outdoor shopping and dining center, Mizner Park, was designed over the site of the old Boca Raton Mall. It has since become a cultural center for southern Palm Beach County, featuring a landscaped central park between the two main roads (collectively called “Plaza Real”) with stores only on the outside of the roads. In 2001, it became home to the Boca Raton Museum of Art, and as of 2002 – a location of the new Count de Hoernele Amphitheater – a large-capacity outdoor venue for concerts and other performances. Completed in 2013, Mizner Park was designed as a classical Mediterranean revival town center and presently features many restaurants, boutiques and galleries. 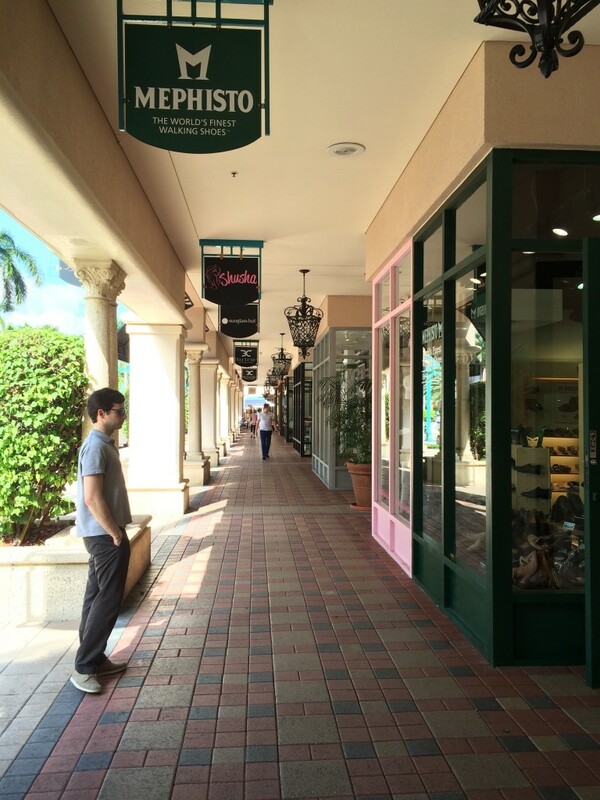 On one afternoon when my husband and I decided to drive “to the city”, Mizner Park looked more like a “trying too hard wanna-be” Mediterranean outdoor mall (if there are any of that kind in Europe) with virtually all of its residents taking siesta. We stopped at Villagio Restaurant for lunch and it was pretty ordinary – from food to service to ambience. Many buildings in town have a Spanish Colonial Revival architectural theme, initially inspired by Addison Mizner. Still today, Boca Raton has a strict development code for the size and types of commercial buildings, building signs, and advertisements that may be erected within the city limits. For ex., neither outdoor car dealerships nor billboards are allowed in the municipality. Go figure! Well, from a farming community of 18 souls in 1903, modern-day Boca Raton is one of the wealthiest communities in South Florida and home to over 93,000 people, most of whom are white, well-educated and well-off or, should I say, rich. According to Forbes, Boca Raton has three of the ten most expensive gated communities in the U.S. – The Royal Palm Yacht and Country Club holds the #1 spot, The Sanctuary – #6, and Le Lac – #8 spot. Boca Raton Resort and Club. To help draw the wealthy away from Palm Beach, Mizner planned to build a large ritzy hotel right on the beach and call it – The Castillo del Rey. This hotel was part of his plan to create “the world’s most architecturally beautiful playground” with miles of “paved and landscaped streets, golf courses, polo fields, elegant shopping vistas, and luxurious mansions for the crème de la crème of world society.” Along with his brother, Addison formed The Mizner Land Development Company, which included such investors as T. Coleman du Pont, Elizabeth Arden, William K. and Harold Vanderbilt, Clarence H. Geist, Irving Berlin, the Duchess of Sutherland, and Paris Singer. The Mizner Development Corporation took in over two million dollars on the first day of sales and an additional two million at the second offering of lots. However, when Ritz-Carlton group was brought on board to run the Castillo del Ray, the hotel had to be redesigned in order to meet the Ritz-Carlton’s exacting standards, and it significantly delayed the start of construction. With the money from lot sales, Mizner decided to immediately build a smaller 100-room Cloister Inn on the west bank of Lake Boca Raton. He also started construction of the many amenities he had promised for the new city of Boca Raton, including the miles of streets, the administration buildings, and a number of houses. Built in the Mediterranean Revival style, with glorious decor and landscaping, complete with gardens and courtyards, The Cloister Inn opened on Christmas Eve, of 1925, with a dinner party, hosted by Addison and his brother. The dinner guests and critics alike fell in love with Mizner’s dream hotel. “The Cloister was simple to severity in its whole yet rich in delights.” Another critic asked: “What could make forms of wood, or stone, or stucco so beautiful that they trouble the imagination?” The entire hotel, constructed in a few short months, was decorated in a stark almost monastic appearance. It featured original antiques, tapestries, and artifacts from Mizner’s personal collection in addition to products of Mizner Industries. Besides offering a gloriously beautiful hotel, inside and out, Addison wanted to extend the tradition of having a high standard of service as well, by anticipating the amenities and comforts of the hotel’s guests. To do so, all service employees were carefully picked and trained. Description of the hotel from a historical record. However, already by the autumn of 1925, Florida’s great land boom began to unravel. Bad publicity was generated by the fraudulent practices of many promoters and transportation embargoes that kept building supplies from reaching the state. Members of America’s middle class traveling to Florida during the summer found its hotels and restaurants closed and its heat, humidity, and mosquitoes unbearable. These factors all contributed to an uncertain real estate climate. Unfortunately, Mizner had entered the real estate market just as it began to collapse. By the time the Ritz-Carlton Cloister Inn formally opened in February 1926, the corporation had serious problems. The hurricane of September 1926, sealed the fate of the Florida land boom and of Mizner’s dream for Boca Raton. By spring 1927, suits were filed asking recovery of property sold to the Mizner company, which led to bankruptcy. In November, Clarence H. Geist, an original Mizner backer and wealthy Philadelphia utilities company owner, purchased the assets for $71,500 in cash and the assumption of around seven million dollars in debts. Nevertheless, Clarence H. Geist, embracing architect’s vision of having a high quality resort hotel, built upon Mizner’s beginning efforts, doubling the size of The Cloister Inn and constructing the Cabana Club, thus expanding the hotel into the Boca Raton Club. Geisth also hired Ohan Berberyan, a Palm beach art dealer to complete the decoration of the hotel. Subsequently, the U.S. Army used the club as barracks during World War II. Touted by officials as “the most elegant barracks in history,” it housed soldiers during the Boca Raton Army Air Field’s operation. Throughout the years, owners of this resort built on the plans of Mizner, adding their own improvements, and always keeping the service to guests as a priority front and center. The Schine family, owners of the Biltmore and McAllister hotels, purchased the hotel in 1944, renaming it the Boca Hotel and Club. Arthur Vining Davis and his Arvida Corporation modernized the hotel, and built The Boca Raton Club Tower in 1969, that is 91m tall, has 27 floors, and is colored in a lovely “Boca pink”. In 1980, Davis and his Arvida Corporation built the resort’s large Beach Club Hotel on the prime oceanfront property where Mizner originally had planned to build his Castillo del Ray. The hotel resort was bought by VMS Realty, in 1983 and after the 2009 renovation, it made an attractive property for the Waldorf Astoria Collection Corp, who bought the whole resort in the spring of 2009. Since its opening, Boca Raton Resort and Club has been a top destination on southern Florida’s Gold Coast. Occupying 356 acres fronting the Atlantic Ocean, it has a private stretch of beach, two 18-hole golf courses, 30 tennis courts, 5 pools, croquet, baseball, basketball and a 27-slip marina. A wide variety of restaurants (13, to be exact) and lounges can be found here, as the Spa Palazzo offers signature treatments like Arabian Ritual Bath. Hmmmm…. 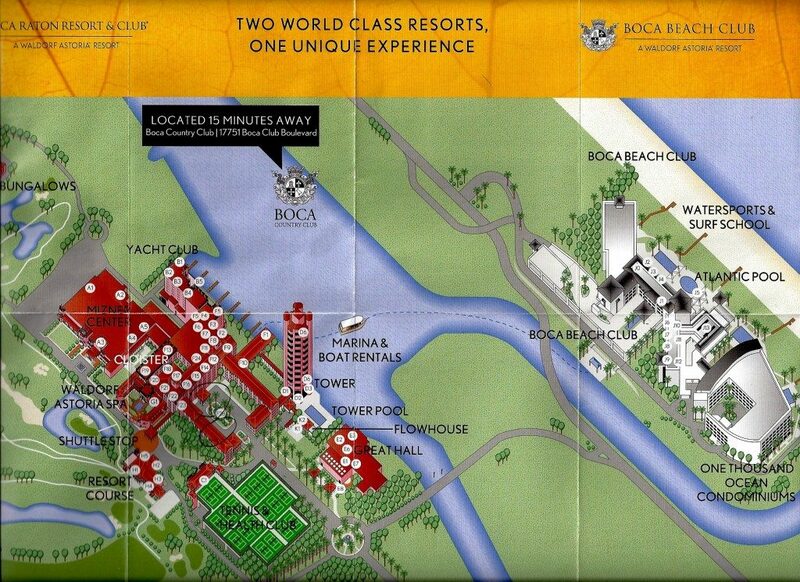 The Boca Beach Club is a gorgeous waterfront property where I was “shuttled” to every day from The Cloisters. At 10 am, I would attend a Hydro-Fitness pool class, in a company of a dozen 70+ year old ladies and even make friends with some of them. Both, the beach and pool facilities were impeccable, service was friendly but not annoyingly intrusive, and fitness instructors were supportive but not super demanding. I was happy that my husband managed to free a half-day to spend it with me at the Club. The Cloisters, or the main building by the lake, is a true Spanish-styled eye candy, where everything, starting with a lobby and finishing with the multiple bars and reception areas, are done in a Mediterranean style. Many parts of the hotel looked like the private premisses of an old European house and multiple plaques with the original photos of the hotel and its rooms, spread out around the hotel, made me feel like staying in a museum. The Lobby was bright and very tastefully decorated. Front desk employees, despite our very late arrival (after 23.00) were very warm and accommodating, expediting the check-in and accompanying us to the room, which took a while to find in a labyrinth of buildings. 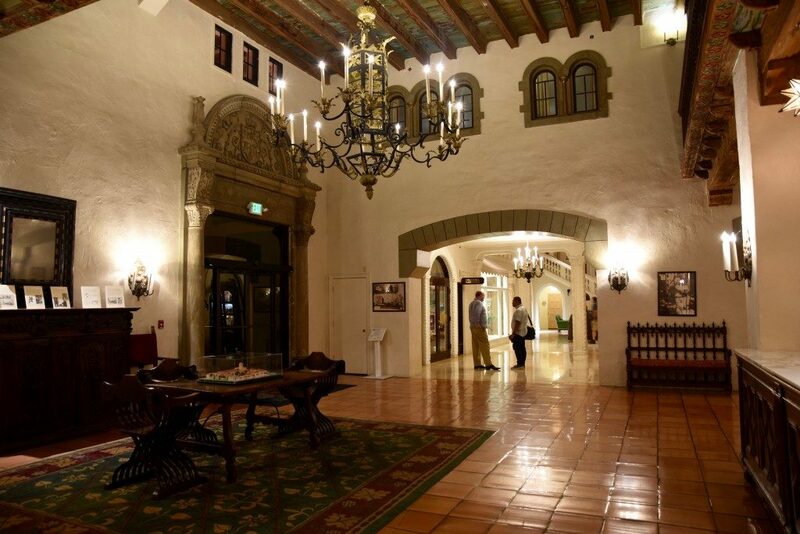 However, the current lobby wasn’t the original one of the Cloister Inn. Entrance to the main lobby of the Cloister Inn was through a large Romanesque arch, “reminiscent of the entrance gate to the University of Salamanca, near Madrid”, according to one newspaper report. The doorway with cypress exterior and walnut interior was created in the Mizner Industries workshops in West Palm Beach. It is important to mention, that in order to provide materials for his projects, Mizner established Mizner Industries, a series of factories producing hand made tiles, pottery, cast stone products and architectural features, wrought iron and tin items, and indoor and outdoor furniture. Inspiration often came from actual antiques which he sold as is or as reproductions. The latter were “distressed” to give them an aged appearance. Mizner Industries products and furnishings were used extensively in the original Cloister Inn, from the tiles on the roof to the chairs in the dining room. The two-story lobby of the Cloister Inn featured heavy cypress beam ceilings and a “medieval style” balcony that wrapped around two walls with arched doorways in the interior. 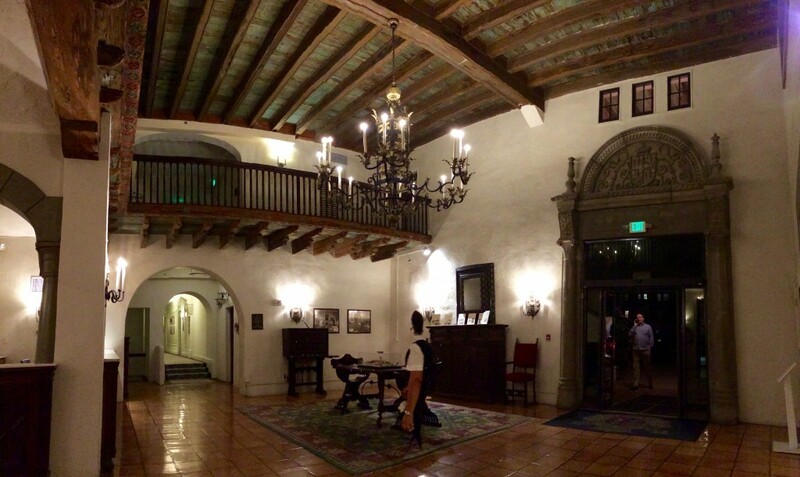 The original Cloister Inn lobby, now called the “Mizner Lobby”, still has an ambience of medieval castle. Originally an Andalusian lantern and Spanish style iron sconces provided lighting in the Lobby; however, in 1930 they were replaced by wooden chandelier and hand stamped metal sconces in a floral design. Presently, the “Mizner Lobby” contains several items worthy attention: the mirror, the chest and the hammered sconces. The antique cabinet and mirror have stood here since 1930, when the Boca Raton Club open (the Club was more luxuriously appointed than the Inn; many of Mizner’s furnishings were reused but in different placement.) The cabinet is of solid oak in a baroque style with stylized carved cartouches on five front panels. It appears to have its original finish and dates to the 18th or 19th century. 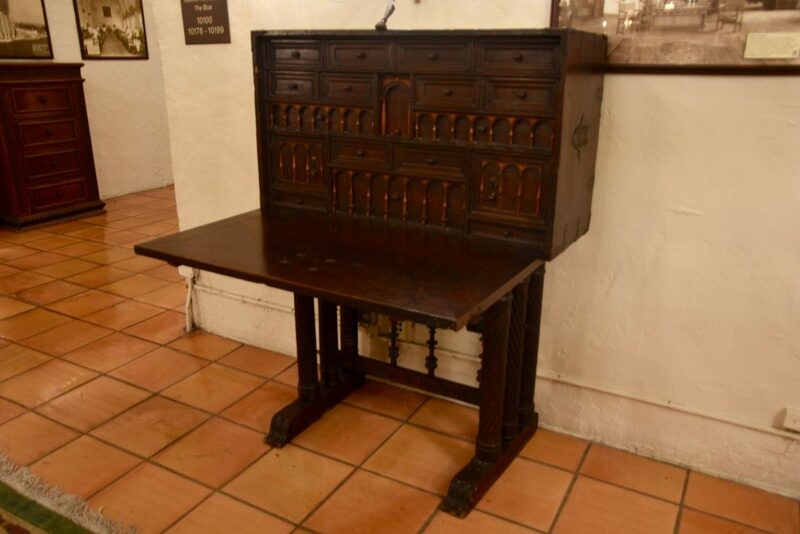 This cabinet may have been part of the original collection of antiques Addison Mizner provided for the Cloister Inn. The late 19th century mirror is constructed from about 12 different sized and shaped moldings of ebonized and gilded hardwoods. Nothing is known about its history other than it is featured in old photos of the Boca Raton Club. This combination of antique cabinet and mirror has precedence in historic Spanish homes. Another antique piece of furniture in the “Mizner Lobby” is the vargueno desk. It is a chest on stand popular in Spain and other countries since the 15th century. The top consists of a full front portable desk, often equipped with sturdy handles and locks and an interior of small drawers and pigeon holes. Vanguenos could serve as jewel or sewing chests as well as writing desks. Many antique vanguenos once graced the public areas and guest rooms of the Cloister Inn and Club. 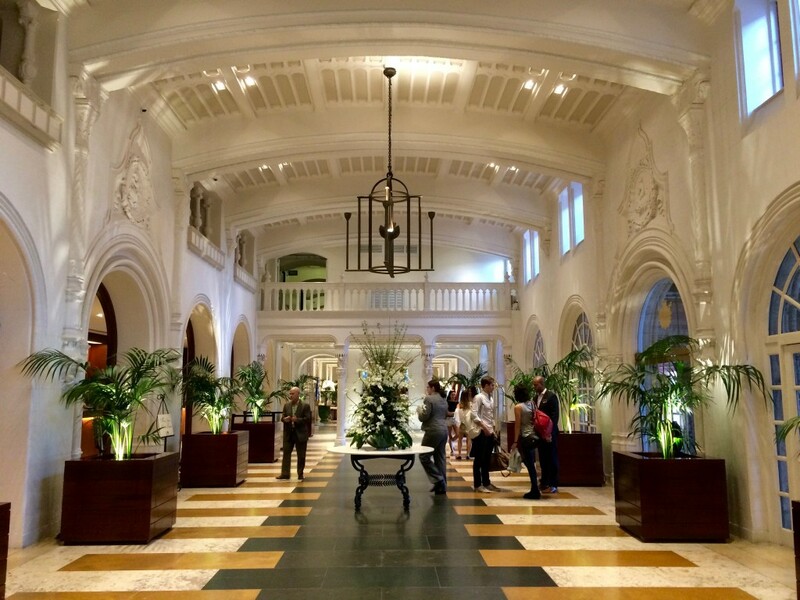 The vangueno in the “Mizner Lobby” is an antique from the 18th or 19th century, the exterior shows much greater wear than the interior. The bottom stand of it could be small chest of drawers or a travel table known as a pie de puente. Three styles of Mizner Industries chairs can be seen in the “Mizner Lobby” today. The chairs around the trestle table are Savonarola style chairs. The wood and upholstered iron chairs mimic an antique Spanish style chair known as a frailero or “monk’s chair”. These were often decorated with nailheads, featured leather or upholstered seats and backs, and rustic and often elaborate carved stretchers. The carved wooden armchairs with baroque style backs and stretchers are another example of the Spanish influence on Mizner’s products. Most rooms and dining facilities were tastefully done within the same style. 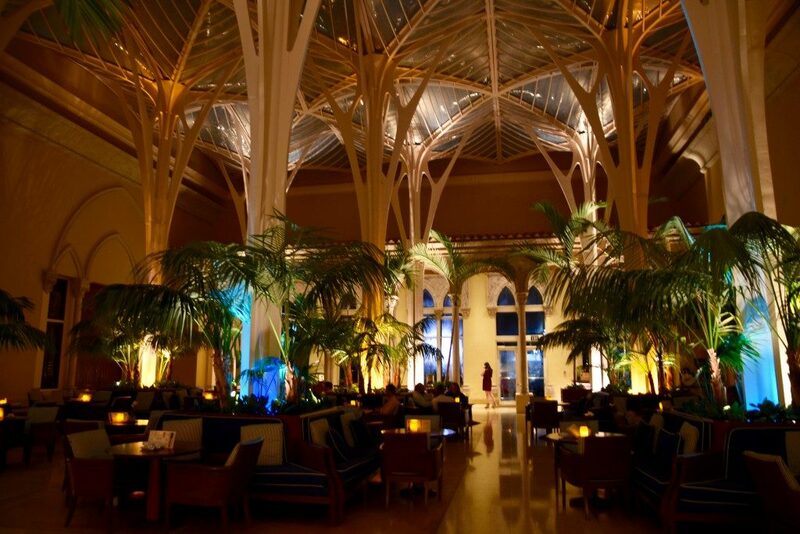 Bar Luna, Palm Court and 501 East Kitchen and Bar radiated sophistication, history and class. It didn’t hurt that the hotel accommodates a lot of conference goers and very few tourists, who prefer to stay at the Club. In the evenings, my husband and I would enjoy the beautiful outdoor spaces – patios, courtyards and gardens – and thanks to the warm November weather, it did feel like Spain. The Pool by the Tower was a great option when I felt lazy to go back to the Club, it was always very quiet and free of children who, luckily for me, preferred to spend their time at FlowRider – a surfing simulation pool. Even though, our room wasn’t easy to find, it had an advantage of being located in a section of the hotel, closest to the Tennis and Health club. 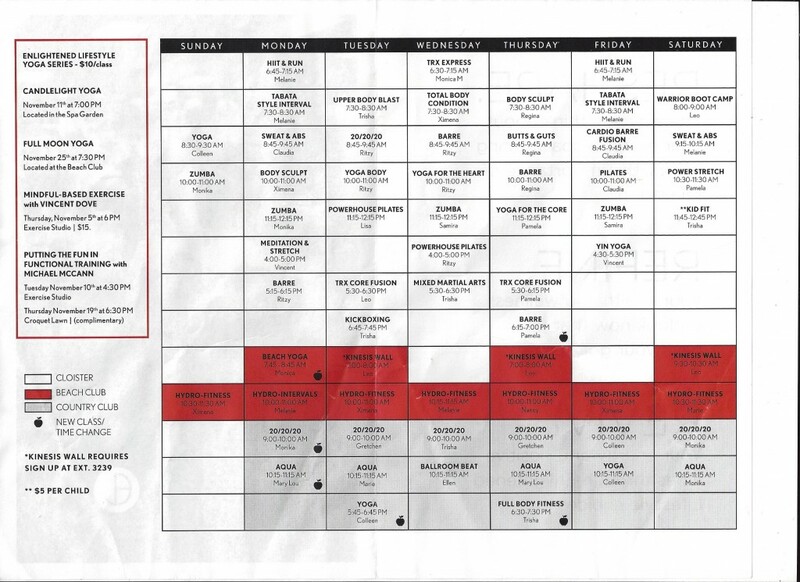 When we checked into hotel, I was given a weekly schedule of classes at the Health Club (free for the guests to attend) and it looked very impressive and… intimidating. I optioned to work out on my own, which was no less fantastic, as I’ve got to try machines and equipment, I never knew even existed. 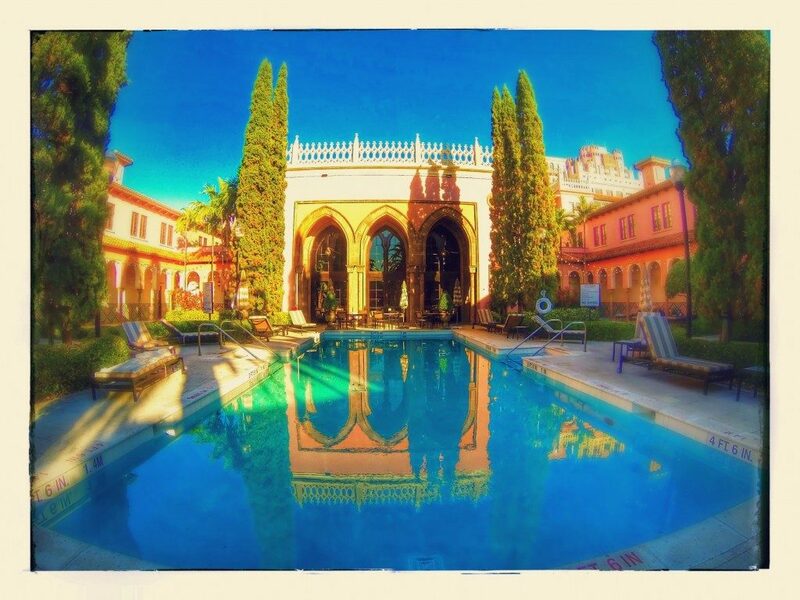 The Spa Palazzo requires its own separate praise as it is a Palazzo indeed! Having read that it was ranked #1 in the World in Conde Nast Traveler’s Readers’ Choice Award a year before, I couldn’t skip the treat! I signed up for a ritual bath with a massage and it beat all my expectations. First of all, once you arrange any treatment, you have an access to all Spa facilities – that is a special rest/dining area and its own pool, set in Andalusian or Moroccan style. Pictures don’t lie, so you can see that I was the only person by the pool all day long! However, for the first few hours, a fashion photo-session took place right next to my chaise-lounge and I felt more pleased than guilty to dive into the pool thus halting their work. I guess lack of people enhanced my spa experience by many folds. The Ritual bath treatment took place in a phenomenally beautiful Moorish bath chamber and consisted of several traditional bath procedures. I started by soaking in a hot tub for about 20-30 minutes – I was given oils and salts to scrub myself squeaky. Then I was invited to go into one of the compact showers where high-pressured hoses gave me a good beating. I have to say that this particular experience was a bit scary, especially when the attendant asked me to keep my head above water. Even though I knew I was standing in a shower and water wasn’t gathering around me, the intensity and quantity of water sprayed out of the hoses made me feel as if I were drowning, very much like waterboarding, only standing up. Well, the feeling did go away after a few minutes, but the bath attendant was always there to guide and to see whether I was ok.
After that experience, I was invited to go into another chamber-tube where other types of hoses, placed along my spine gave me a very relaxing 20-minute hydro-massage. 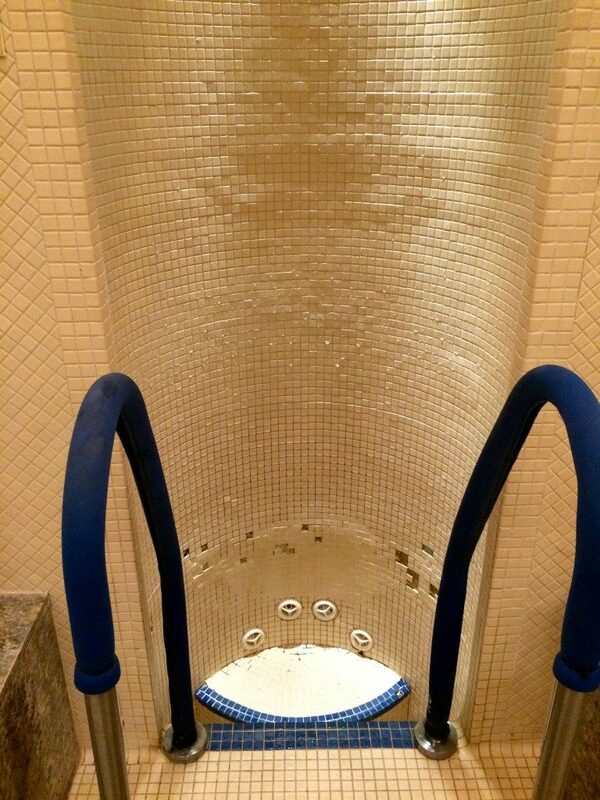 I finished my Ritual bath in the mild spa pool, alone, just as I started it! Shortly, I was escorted to the Spa’s waiting area, which was a beautiful room supplied with all sorts of fruits, nuts and teas. I didn’t wait long to be called for the massage which was simply superb! After that experience, I did feel like a Million Dollar baby! Gumbo Limbo Nature Center is one of a few interesting places to visit in Boca Raton. Founded in 1984, it is a unique cooperative project of the City of Boca Raton, Greater Boca Raton Beach and Park District, Florida Atlantic University (FAU), and Friends of Gumbo Limbo, to protect and preserve coastal and marine area and educate locals and visitors about the environment. This center had 4 huge salt-water tanks brimming with sea life, from coral to stingrays to spiny lobsters and sharks, and we came right for the feeding time to see them all out and “hunting”. 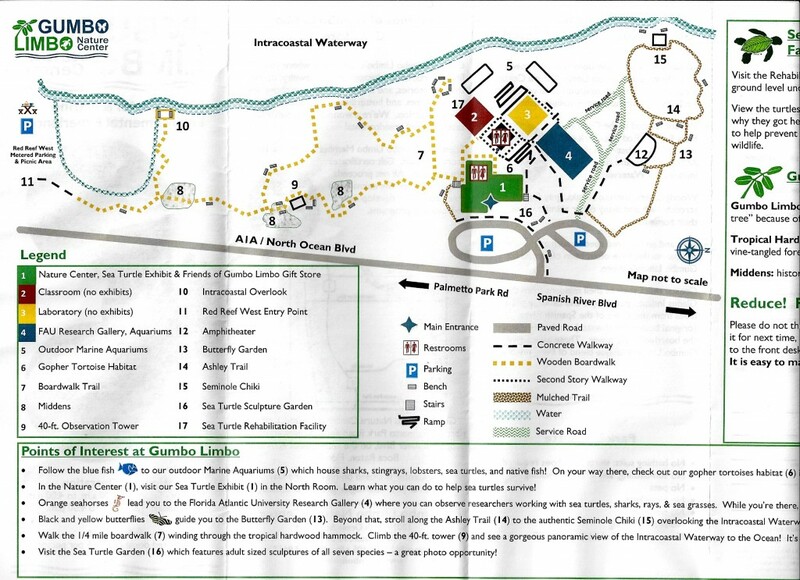 There is also a nature trail and butterfly garden, a 400 m boardwalk and a 12-m observation tower, where you’re likely to see brown pelicans and osprey. 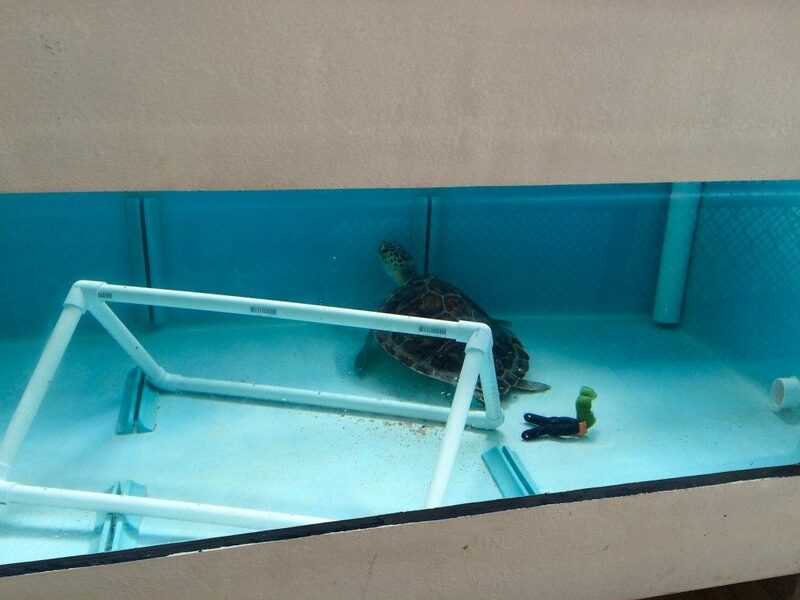 But the most impressive, in my opinion, was the Center’s Turtle Rehabilitation unit where individual pools contained rescued turtles that for whatever reason needed medical help or assistance. Each pool had an information plaque citing the name, weight, age and the medical condition of the turtle. When we were there, at least half-dozen turtles were getting a treatment. At the Center, we spoke with many attendants who seemed to be volunteers and they all were very eager to share with us their knowledge and experience. We especially liked a lady at the turtle rehabilitation clinic, who came to Florida from Switzerland when her husband was relocated there for work, and who found her calling by helping the turtles to recover from the man-made injuries. Please, visit Gumbo Limbo and donate to them as they are truly doing a great job! This entry was posted in North America and tagged Addison Mizner, Boca Raton, Boca Raton Resort and Beach Club, Captain Thomas Moore Rickards, Clarence Geist, Florida, Gumbo Limbo, Mizner Park, The Florida East Coast Railroad, Villagio restaurant, Waldorf Astoria resort. Bookmark the permalink.